As if people weren't already excited about the upcoming Star Wars theme park expansion coming to Disneyland and Disney World in 2019, we now have word that the attraction will bring alcoholic beverages to the parks. The theme park expansion, officially titled Star Wars Galaxy's Edge, is set to open at both of Disney's parks next year and they have slowly but surely been unveiling details regarding the attractions. Now, they've provided some info on Oga's Cantina, which comes with the welcome news that Star Wars themed booze is coming our way. Disneyland first opened to the public in 1955. Ever since then, the only place that one can get alcohol within the confines of the park is at the exclusive, members only Club 33. 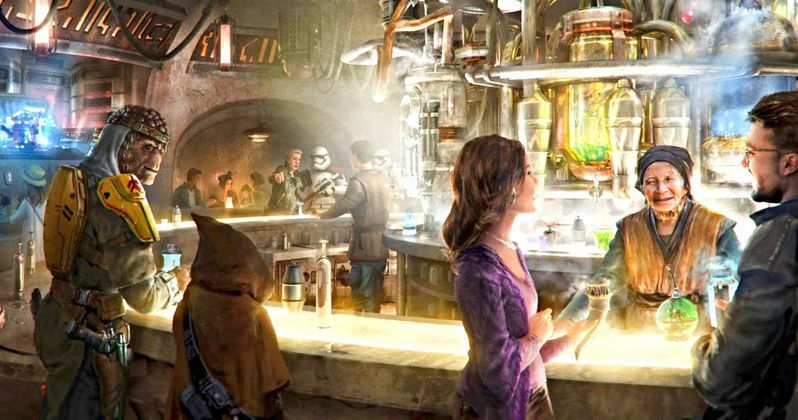 That's set to change with Star Wars: Galaxy's Edge, as an official description of Oga's Cantina, which will be reminiscent of the Mos Eisley Cantina, reveals that adult beverages will be amongst the offerings that patrons can enjoy at the establishment. The description reads as follows. "Oga's Cantina is the kind of establishment that attracts some of the most interesting and disreputable characters in the galaxy. And you never know when a stormtrooper or a familiar face will show up. Patrons of the cantina come from across the galaxy to sample the famous concoctions created with exotic ingredients using 'otherworldly' methods, served in unique vessels. With choices for kids and libations for adults, the cantina will make for a great stop!" Just in case that wasn't clear enough, a Disney park representative clarified in a statement to Nerdist that the cantina "will serve an innovative menu of non-alcoholic and alcohol-based custom cocktails along with beer and wine options." So there you have it. Maybe we can get some version of a Blue Milk White Russian? This should allow for some creative drinks that will no doubt come at a price that might even make Jabba the Hutt blush. It's pretty amazing that Disney is going to make such a dramatic change after more than fifty years, but if there were ever a time or place to do it, it's with Star Wars: Galaxy's Edge. Aside from the drinks, RX-24, the former StarSpeeder 3000 pilot droid we first met in Star Tours, has been repurposed as the cantina's DJ. Figrin D'an and the Modal Nodes may not be there, but RX-24 sounds like a fine replacement. The cantina will be run by a new character named Oga Garra, who is described as "an intriguing alien proprietor." Star Wars: Galaxy's Edge will also feature a ride that allows visitors to pilot the Millennium Falcon, as well as another attraction that takes place on a Star Destroyer. The attraction is on the planet Batuu at Black Spire Outpost and takes place during the timeline established in the current trilogy, meaning it will focus on The Resistance and the First Order. The attraction will open at both Disneyland and Walt Disney World in 2019. Be sure to check out some new concept art for Oga's Cantina from the Disney Parks Blog for yourself below.